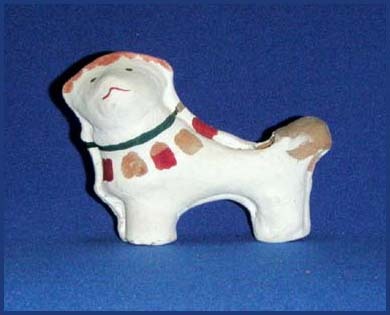 The dog 戌 is one of the 12 zodiac animals of the Asian lunar calendar. 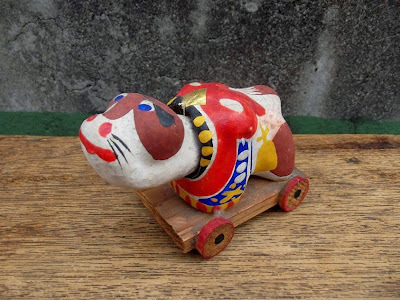 He is therefore a well-liked animal in folk art and handicraft. 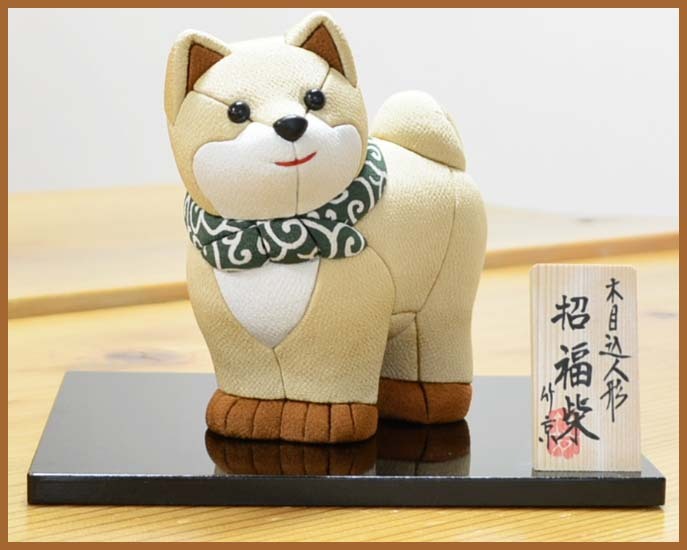 2018 is the Year of the Dog.
. 12 zodiac animals 干支 eto, kanshi . 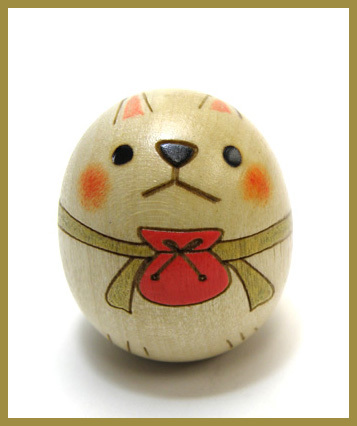 As an amulet for an easy birth it is known in many parts of Japan. 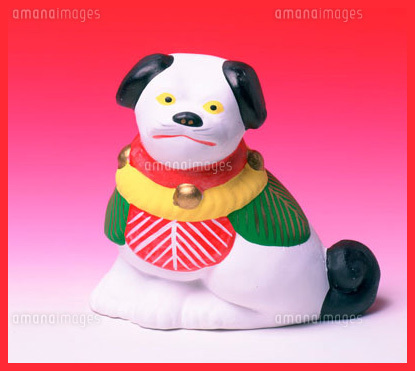 It comes as a papermachee doll, clay doll or clay bell and other materials.
. INU - the dog　犬 as a kigo . 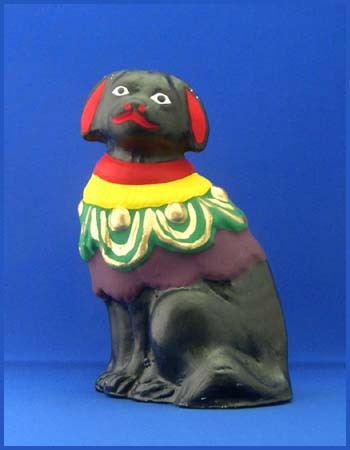 First of Novebmer (11.1) is "Day of the Dog"
This is a play of words. The deity Inuhime-no-kami 伊奴姫神 is only worshipped in this shrine. 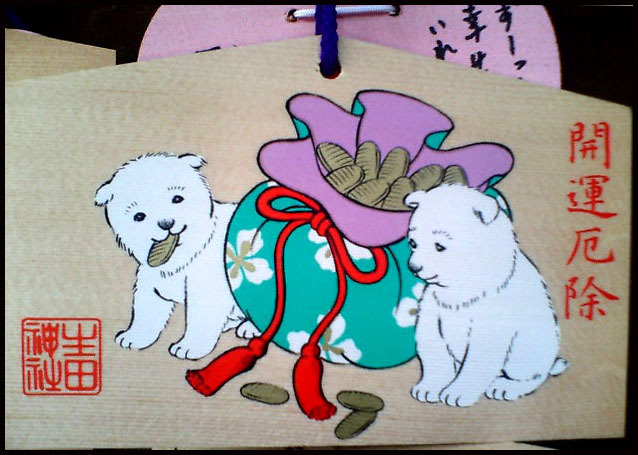 Since a dog gives an easy birth, a pregnant woman has to come to this shrine on the day of the dog in the fifth month of her pregnancy and get a special white maternity band for her stomach (iwataobi, iwata obi 岩田帯) . Some women by that band at the shrine, others buy it in a shop and bring it here for a special purification ritual before using it.
. Inu Jinja　伊奴神社 "Dog Shrine", Nagoya .
. Daruma 「 だるま」and dogs - the Dog Year 2006 .
. . . CLICK here for more Photos　!
. 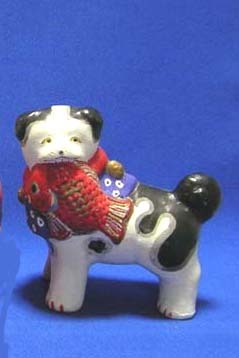 Nishio no inu 西尾の犬 dog from Nishio . Hachiko in front of Shibuya station is a dog from Akita. The top left is from 秋田県大館市のアメッコ市 Odate, Amekko. 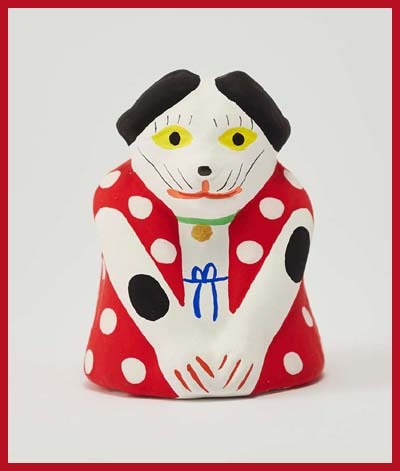 is a large breed of dog originating from the mountainous northern regions of Japan.
. Yuzawa no inukko 湯沢の犬っこ dogs from Yuzawa .
. Hakata tsuchi ningyo 博多土人形 Clay doll from Hakata .
. Miharu hariko 三春張り子 papermachee dolls - dog .
. botan chin 牡丹狆 Chinese spaniel dog with peony pattern .
. yome-iri, yomeiri 嫁入り人形　bridal dolls, wedding dolls .
. Tosa Fighting Dog - Introduction . 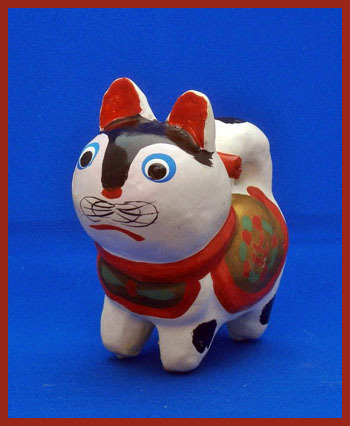 This is a clay doll from Fushimi. 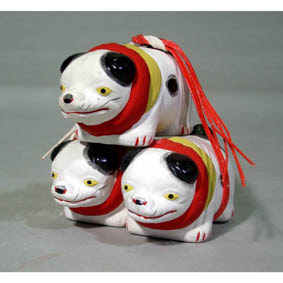 Three dogs are bound together with an auspicious red and white mizuhiki rope. Thus they can prevent the "three worms" of small children to come out and trouble child and parents. 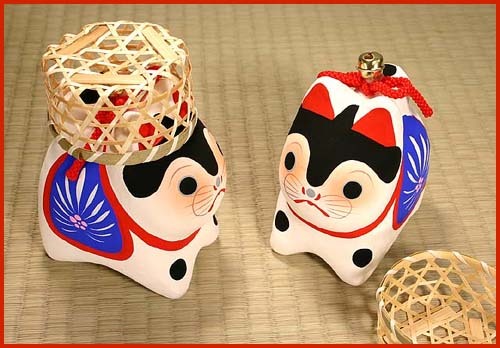 They are sold near Fushimi Inari shrine. 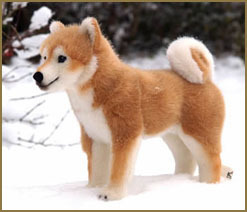 They have a simple face lookig forward mamuki inu　真向犬. 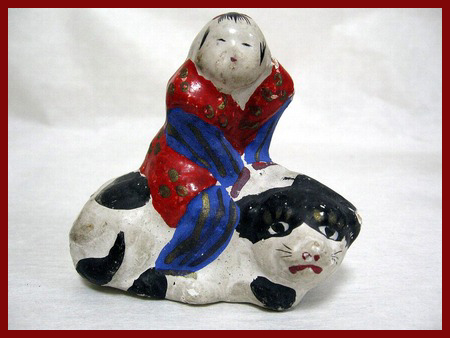 The Three Worms in Taoism and Chinese Mecicine .
. Clay Dolls from Fushimi - 伏見土人形 . 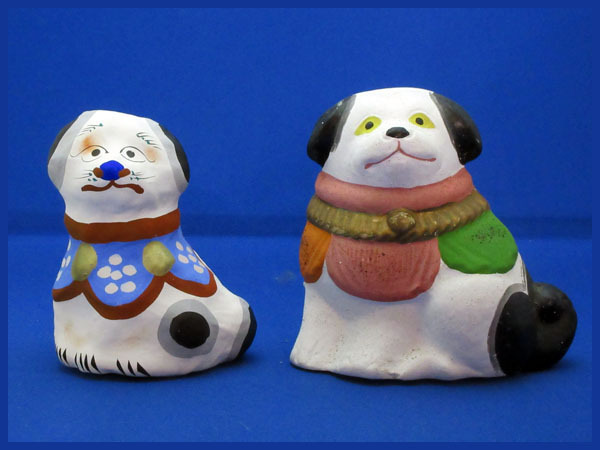 The dog on the right is from Fushimi (Kyoto). 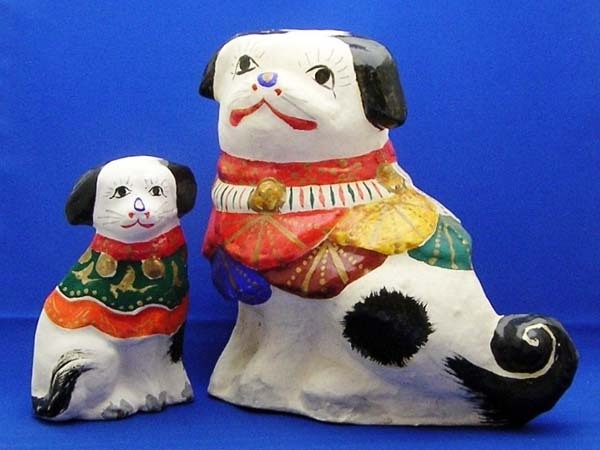 The dog on the left is from Miharu (Fukushima).
. Hokkeji no mamori inu 法華寺の守り犬 protector dog .
. Koma-inu dogs and bird こまいぬ .
. Koorai inu, Korai inu 高麗犬 Korean Dog .
. mutsumi inu 睦犬 / 睦み犬 coupling dogs .
. Konosu ningyoo 鴻巣人形　Konosu Ko no Su - aka chin 赤狆 red dog . made by Zawaya san 沢屋. 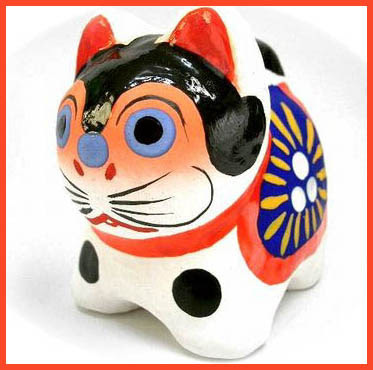 Since the beginning of the Meiji period, when some samurai from Edo (where the famous Dog Hariko were made) moved to Shizuoka. So their form is similar and they are an amulet to ward off evil. 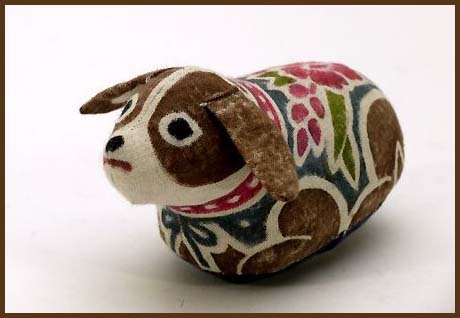 Also for an easy birth.
. kibigara zaiku きびがら細工 handicraft made from millet - dog . papermachee dogs with a little denden drum . 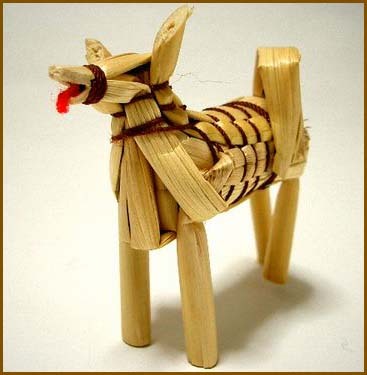 The dog is from papermachee, the basked woven from bamboo. 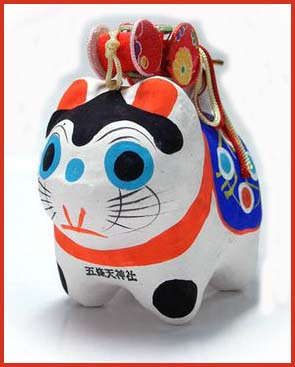 The basked is an amulet for raking in good luck and a healthy upbringing of small children. 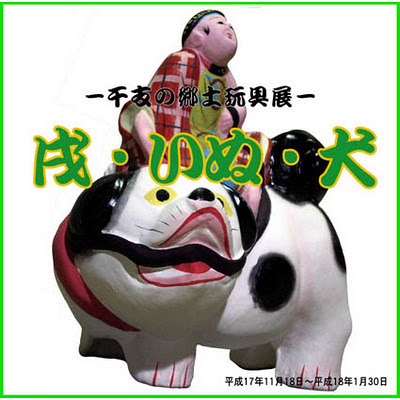 The Chinese character for bamboo basket　笊　is a pun with the meaning of the compuond images of the character, bamboo on top of a dog, which is similar to "smile" 笑. This toy will keep the children laughing. The auspiciuos basket will also let the wind pass through it, so when it is hung over the baby bed, it will prevend the child from getting a stuffed nose or catch a cold. 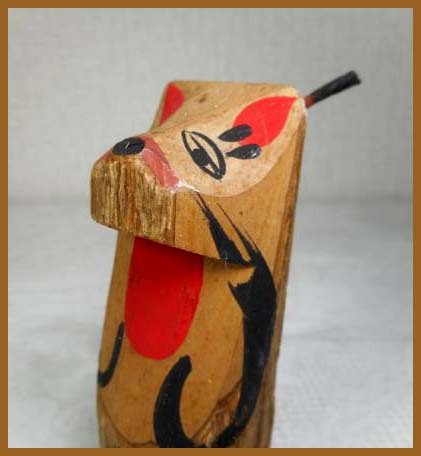 This happy dog is one of the most typical toys of Edo. Parents or relatives used to buy it during a first visit with a baby to the nearby shrine or temple. 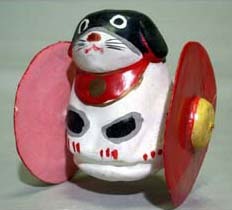 Many dogs also carry a little toy drum (denden daiko デンデン太鼓). 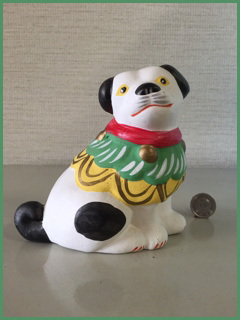 The dogs from the shrine Torikoe Jinja 鳥超神社 Torigoe Jinja in Taito Ward are most famous. This shrine is very old and dates back to 651. The annual festival in June is quite famous, because their portable shrine (mikoshi) is the heaviest in Tokyo. In the evening, many lanterns provide a joyous atmosphere. The shrine is the final resting place of the legendary leader 日本武尊 Yamato Takeru no Mikoto. 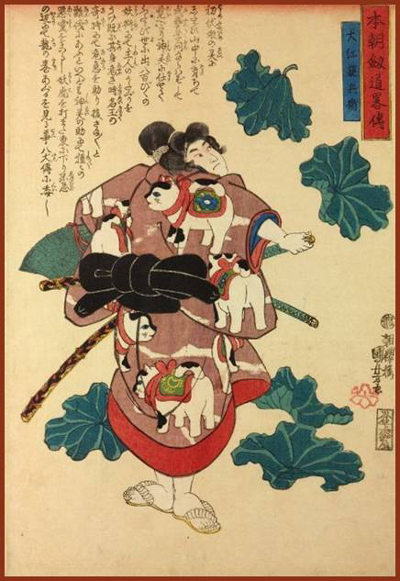 A former prince and ruler in Japan, stories of Yamato Takeru have been told for centuries. 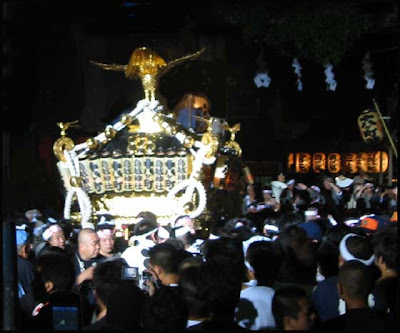 The deity of the shrine was first called Hakuchoo Myoojin 白鳥明神 Hakucho Myojin (Swan Deity). In the late Heian period, Minamoto no Yoshiie was shown his way through the wetlands by 白い鳥 "white birds" 越 crossing over. 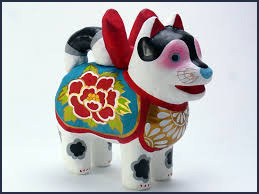 To show his gratitude, Yoshiie venerated 鳥越大明神 Torigoe Daimyojin. Thus the name Torigoe (birds crossing over) was given to the whole district.
. Edo Torigoe 鳥越 Torigoe Ward (Torikoe) .
. Minamoto no Yoshiie Hachimantaro 源八幡太郎義家 / 源義家 .
. Suitenguu 水天宮 Shrine of the Water God . 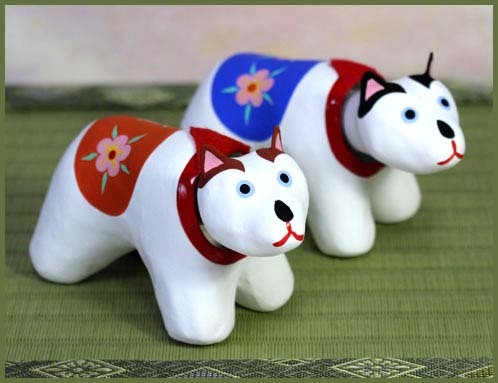 Pregnant women come here on the day of the dog (inu no hi 戌の日) to pray for an easy delivery.
. michibiki inu 導き犬 "dog leading the way" .
. Sagara tsuchi ningyoo 相良土人形 Sagara clay dolls . 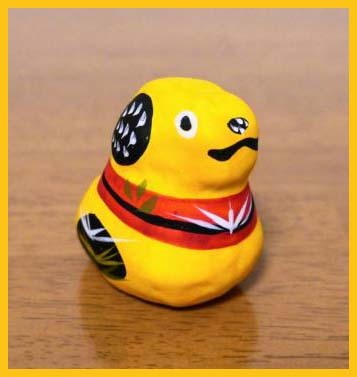 inubako, inu-bako 犬箱 "dog box"
They are made of washi paper, usually a pair of them. Sometimes bamboo and wood are used for the frame. They are a symbol of fertility and were given to a bride as her trousseau. They were a talisman for easy childbirth. Some state that the bride had to send back one of the boxes including a piece of paper with the "proof" of her first successfull union with the husband. 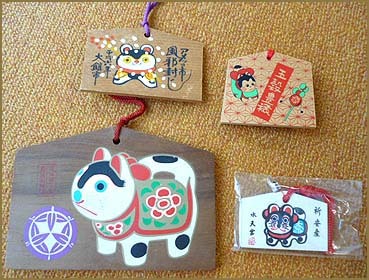 They are decorated with auspicious symbols. 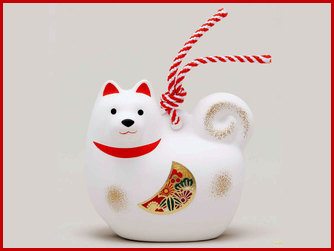 Click on the image for more samples.
. WKD : Dog (inu) KIGO . 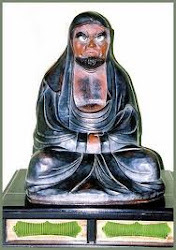 and his relation to Yanahime Jinja.
. Koozenji 光前寺 Kozen-Ji - Nagano . amulets sold at the temple !